A perfectly-balanced, close and stylish shave! Wahl's 5 Star Cartridge Razor shaves as good as it looks! It comes fitted with a Gillette Mach3 blade, as part of an interchangeable blade cartridge system. This means you can always ensure the closest of close shaves. 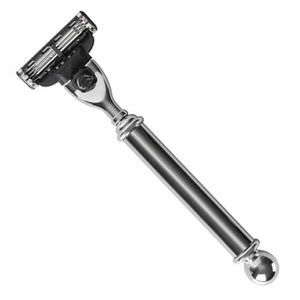 And with the perfectly-balanced chrome-finished handle lending your hand confidence, your clients can look forward to a luxurious and classy shaving experience. It's a classically-styled razor that manages to look contemporary and vintage at the same time! A touch of luxury from Wahl. £23.99 (inc. VAT) Why no VAT? We're a trade wholesaler and quote our prices without VAT to help our VAT-registered customers understand the true cost of a purchase.